Consumers and businesses are becoming increasingly aware about the dangers of exposure to data theft, phishing attempts, ransomware and other harmful or inappropriate content. As a service provider, you have a great opportunity to offer web security and user protection in the form of Security as a Service (SECaaS), and so generate incremental revenue while strengthening loyalty to your brand. 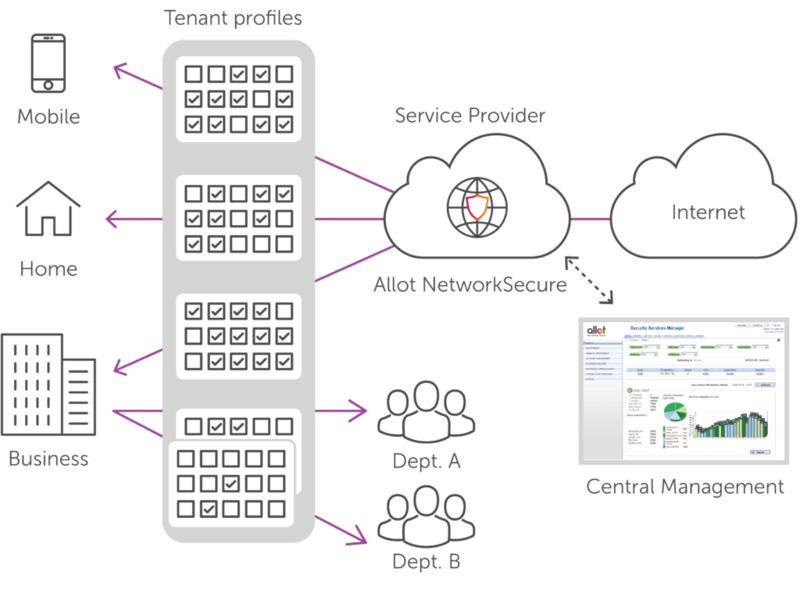 A multi-tenant solution, NetworkSecure enables personalized security policies, event handling and reports for the mass market. It powers the world’s largest deployed network-based security service, with over 20 million paying customers. Whether your customers are individuals, a family or a business, NetworkSecure supports many kinds of tenants with customizable user interfaces. A tenant can be an individual, a family looking to apply parental control or a business securing its employees. Small businesses are extremely vulnerable to cyber-attacks, and typically lack in-house security skills. CSP delivered security gives small business owners peace of mind while keeping inappropriate content out of the workplace. Families can use NetworkSecure parental control to apply simple security configuration settings that ensure their kids only view appropriate content and that they get sufficient quiet time. Parents can also receive security alerts activated by their kids’ online activity. Empowering families to set security policy is a proven value-add that strengthens loyalty to your platform. With NetworkSecure, all security services are fully provisioned and activated in the network. You can simultaneously turn on the service for any, or all, customer segments and immediately start generating revenue of around $1 or €1 per customer per month. There’s no need for your customers to download, install or activate anything. With this frictionless onboarding, launching a mass informed “Try and Buy” campaign, for example, has been proven to achieve over 15% service adoption in the first year. Allot has 20+ years’ experience working with communication service providers across the world. A telco grade solution, NetworkSecure fully integrates with CSP networks and systems. Our customer success teams engage with the CSP’s marketing team, helping them to plan, launch, and promote their security service for maximum service adoption and retention. Several European Tier 1 service providers have already achieved more than 50% adoption rates by selecting Allot and NetworkSecure as their security service solution. You can deploy NetworkSecure as standalone software, within an NFV architecture or, if you have an existing Service Gateway, integrate within the SG Tera chassis. Offer cybersecurity services that protect user and IoT devices in the connected home by leveraging existing CPE. Surgically mitigate both inbound and outbound volumetric DDoS attacks, while maintaining optimal QoE for applications and users.